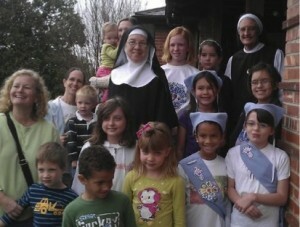 Greetings from Mother Miriam from France! Christ is risen, risen, risen, risen. He is risen indeed! I know that you know and believe that! And I know and believe it. But I don’t know that I will ever get over it. How can the finite (and sinful) mind of mere creatures conceive of a God who would become one of us – knowing that, in becoming vulnerable to our depravity, we would nail Him to the Cross? But He rose, He rose, He rose – from the dead to give us life. He knew the Father would raise Him from the dead – He came to die (as we wrote over and again in our Christmas newsletter). Yet that “plan from all eternity” did not lessen His sacrifice for us, nor the unfathomable truth that “For our sake (God) made Him to be sin who knew no sin, so that in Him we might become the righteousness of God” (2 Corinthians 5:21). Salutations de France! (Greetings from France!) We send our boundless joy, our hope for all that lies ahead in the One who works all things together for good, and our ceaseless prayers for you this Blessed Advent and Christmas. Indeed we miss you all! 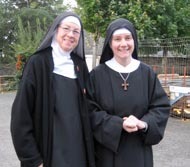 Yet our Blessed Lord has confirmed over and over again His generous and perfect will in bringing us to this most excellent community of Benedictine Sisters in Angers, France. 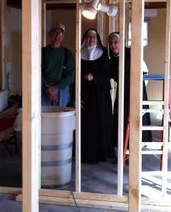 I am more confirmed in my heart than ever before that our coming under the guidance and example of the Servantes des Pauvres (Servants of the Poor) this year will give us the formation in religious life necessary for the building of our new foundation, and in a way that will bring honor to the One to Whom all honor is due. From time to time, we are able to connect to the internet and to see what is taking place in the United States. Our beloved country appears to be taking a most grievous path, and with increasing speed, toward the destruction of the family, the country, and even our very faith. What to do? How do we remain faithful in the midst of such evil and even apostasy? And how can we make a difference? 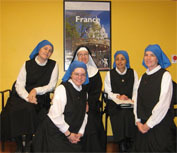 Look what our Blessed Lord has done – He has given our new community the inestimable gift of being formed by a wonderful Benedictine community in France, the Servantes des Pauvres (Servants of the Poor) who have graciously invited us for a year of formation. But Mother Miriam, what about all you have planned to do in Tulsa – helping families, teaching the faith, reaching out through the streets? I know, dear Zelda. We wish indeed to do all that, to help families to know, love and live the faith at home, to help parents to impart our very identity and vocation as Catholics to their children, and to reach out to every soul. And our blessed Savior is leading us to do just that, even more wonderfully than we had imagined, through the building of a solid and deep foundation. Dear Mother Miriam, I know that Pentecost celebrates the birth of the Church, but I was taught also that the Church was born from the pierced side of Christ on Calvary. Can it be both? Perhaps in a sense, dear Zelda. Just as with human birth, life begins at the moment of conception in the mother’s womb. Yet the fullness of its manifestation, so to speak, takes place nine months later at the birth of that child from its mother’s womb. 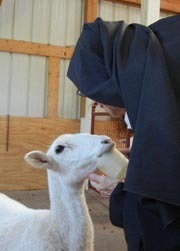 How wonderful it is to be able to send you this Advent-Christmas newsletter after so many months and so very many happy developments here in Tulsa at the new Priory of Our Lady of Guadalupe! And what blessed joy it is to share with you the glories of this most miraculous season and the never-ending wonder of the God of Abraham, Isaac, and Jacob who entered time and history – and became Man. No… could it be true? The Tomb is empty? He’s not there? What happened?! What does she mean, “They have taken the Lord out of the tomb.”? Wait! …didn’t He say something about rising on the third day? But it’s impossible, isn’t it? How could He be alive? They crucified Him. And they buried Him – we know that. Oh our hearts… John, wait up! They both ran, but the other disciple outran Peter and reached the tomb first; and stooping to look in, he saw the linen cloths lying there, but he did not go in. Then Simon Peter came, following him, and went into the tomb; he saw the linen cloths lying and the napkin which had been on his head, not lying with the linen cloths but rolled up in a place by itself. Then the other disciple, who reached the tomb first, also went in, and he saw and believed; for as yet they did not know the scripture, that He must rise from the dead (John 20:4-9). What do you think? 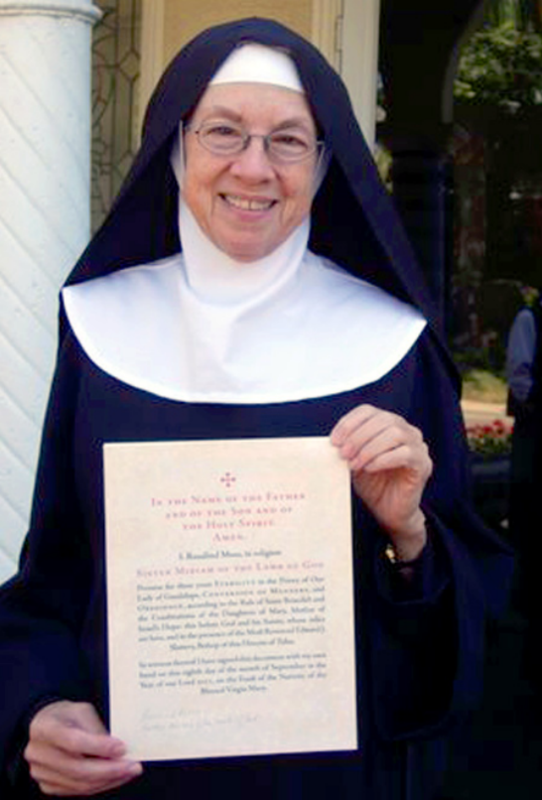 It took us 11 months – between last Christmas (when we left St. Louis) and last month when we at last were able to mail our first newsletter from Tulsa and with its thrilling contents of the ceremony of the “Rite of Clothing of the Holy Habit” with Bishop Edward Slattery and Father Mark Daniel Kirby. We are still basking in the beauty and happiness of that glorious day. Now, only one month later, you are receiving our second newsletter of 2011. How could I let pass this most glorious season of the year without thanking you with all my heart for your share in this most thrilling venture for our King and His Kingdom? Oh the ceaseless wonder of the coming of the long-expected Messiah – of He who is eternal yet entered time; He who is Spirit, yet became Man; He who is the Creator of all that is, who created the Woman from whom He would take flesh and blood, in the fullness of time, and in fulfillment of all that the prophets spoke – for us, for us, for us – that we may live with Him forever. 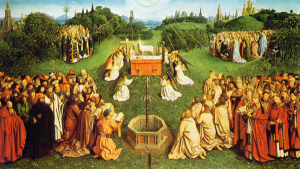 The seed of Abram did not begin with Abram…. That seed had its beginning in the Garden some 2,000 years prior when, in consequence of Adam and Eve’s disobedience, God promised to send a redeemer, a deliverer, one who would come from the union of Adam and Eve to reverse the curse that separated them, and all of mankind to follow, from God and from blissful union with Him with whom they walked and talked in the Garden of Eden. And God said to the serpent in the Garden: “I will put enmity between you and the woman, and between your seed and her seed…. It is, as I write, just ten days prior to my departure from this most blessed Novitiate year with the Order of the Visitation of Holy Mary. 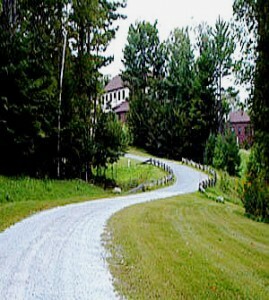 The pictures to the left from their website are a glimpse of the beauty of this holy place tucked into the Berkshires. 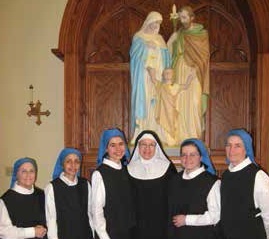 Although by the time you receive this newsletter the Feasts of the Visitation (May 31), Corpus Christi (June 6), and the Sacred Heart (June 11) will have passed, I did not want to miss pointing out the glorious connection between the three which struck me so wonderfully as I shared in their celebration with the Sisters in Tyringham. the Visitation of Mary to Elizabeth!